We celebrated my husband’s birthday on Easter, as we often do. His birthday is April 7th so since we already have the family gathered together, it is just easier to celebrate both on the same day. I was tasked with making his birthday cake. Ron isn’t much of a sweets eater so this wasn’t as easy as it may seem. After some going back and forth, and based on the success of my Peanut Butter Cup Trifle, he decided he wanted a Strawberry trifle. We discussed what he wanted in his trifle and then I made a plan. I did my shopping and prep on Saturday and then I brought everything to my mom’s house to be assembled after Easter dinner. When he arrived, my nephew asked what I had made for dessert and I told him that I was going to put together a strawberry trifle. He asked if he could help, I got him started and he did the rest. 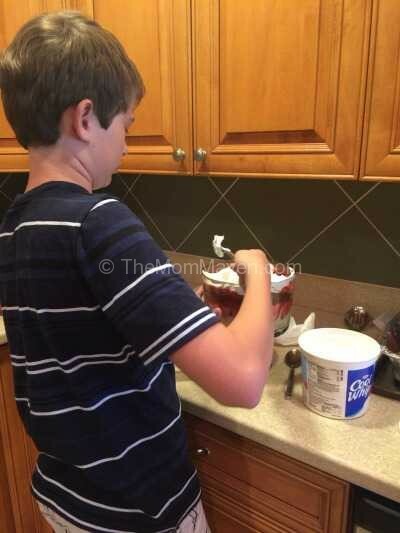 He was very proud of the Strawberry Trifle he made for Uncle Ron’s birthday. This recipe calls for the Strawberry Sauce, which I shared with you last week. 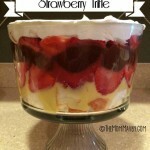 The strawberry Trifle is a light dessert perfect for spring and summer celebrations. Place a layer of the cake cubes on the bottom of the trifle dish. Next a layer of vanilla pudding. Starting along the outside, place sliced strawberries around the bowl. Lay strawberries on top of the vanilla pudding. Cover the strawberry layer with a thin layer of strawberry sauce. Next, a layer of chocolate pudding. Repeat the strawberry/strawberry sauce layer. Yum! 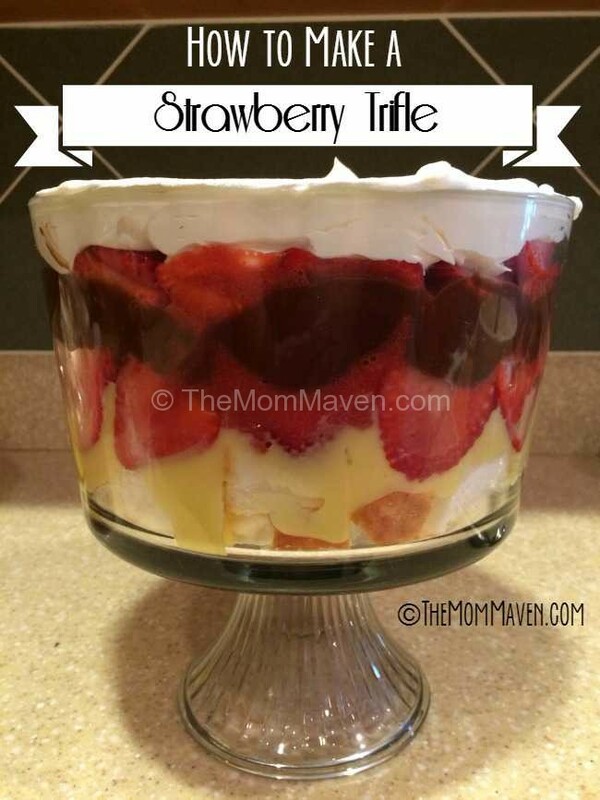 Let’s make a Strawberry Trifle! This trifle is wetter than the Peanut Butter Cup Trifle so it was a little more difficult to serve. It was well received but many of us felt we could have omitted the chocolate layer and replaced it with another vanilla layer. That is the fun of trifles, each time you make one you can try something new. Wow, it sure it a delight to have a desert that does not through you over on your caloric intake for the day. Strawbrerry Trifle it is. My middle child isn’t a big fan of chocolate so I’d probably omit the chocolate layer for her. I think it sounds perfect as is. I’ll happy gobble up strawberries & chocolate! Annnnnnd DROOL. This looks delicious and not super difficult to make, I’m definitely doing this soon! This is one of those desserts I never think to make for cook outs, but looks so good. Maybe for the next one I will. My kids would be all over this treat! It looks and sounds delish. That looks delicious and so easy to make! I’ll have to try it out the next time we have a cookout! This looks amazing, I really need to try this recipe. My family would love it.